The mounting cultural obsession with vampires and other mythical creatures in the past decade or so has given rise to many popular books like the Twilight Saga; TV shows such as the Vampire Diaries; and movies like Abraham Lincoln: Vampire Hunter. However, this Vampire Renaissance is not limited to popular media — it has even spread into the realm of dance. Be prepared for a truly biting performance as Ballet Victoria, Vancouver Island’s most prestigious professional ballet company, returns to the McPherson Playhouse this October with a performance of the classic story of Dracula just in time for Halloween. This will not be the first time that such a unique blend of folklore and classical dance has appeared on stage. 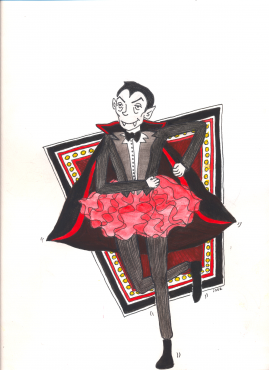 Back in 2014, Ballet Victoria’s Artistic and Executive Director Paul Destrooper choreographed a full-length ballet adaptation of Dracula for the twelve-dancer troupe. I was lucky enough to attend a performance in 2014, and I was blown away by the range of music genres included in the two-act ballet, which featured pop singer Sia’s hit song “Chandelier” and Elgar’s beautiful Cello Concerto. Plus, Destrooper honed in on the sensuality of love and immortality depicted throughout the ballet rather than on the gruesome elements, so it is a wonderful show for adults and children alike. While many may ask why, I think the better question is why not? Bram Stoker’s 1897 Gothic horror novel Dracula is far from the first classic novel to be adapted for the stage as ballet. Margaret Atwood’s The Handmaid’s Tale, Charlotte Perkins Gilman’s The Yellow Wallpaper, and Ernest Hemingway’s The Sun Also Rises are just a few examples of classic novels that have been adapted into ballets. And, in case you needed more convincing, Ballet Victoria is not the only dance company to perform a Dracula adaptation. In fact, Dracula seems to be a cult classic that companies wake from their repertory slumber every few years because it always sells out. Dracula had its premiere on Oct. 7 in North Vancouver, and will continue on to Chilliwack and Courtenay before arriving in Victoria for three shows from Oct. 27–29. Afterwards, it will tour to Salt Spring Island in early-to-mid-November. Whether you are a diehard vampire fan or a ballet lover, this ballet will both feed your fantasy of vampire myth and get you in the Halloween spirit (or, at the very least, give you some great vampire costume inspiration).